I gave a talk about walking the Camino Francés last night in an informal lecture series called “Chicken and Wine.” It seemed to go pretty well and I thought I might post the text here. Who knows? Maybe somebody will run across this blog and start thinking about walking the Camino themselves. I hope so. Do you remember that song those two Scottish twin brothers—the Proclaimers, that was their name—had a hit with twenty or twenty-five years ago? “I would walk five hundred miles, and I would walk five hundred more”—remember that? Well, I did walk five hundred miles—about this time last year, as a matter of fact, in September and October—and I would walk five hundred more, too. In fact, if I could, I’d leave tomorrow and do it all again. What a strange thing to say. What a strange thing to do! Why would anyone walk that kind of distance? And why would anyone want to repeat the experience? What on earth am I talking about? Well, the five hundred miles I walked was on the Camino de Santiago, or the Way of Saint James, the medieval pilgrimage route across northern Spain from Saint-Jean-Pied-de-Port—Saint John at the Foot of the Pass, in the French Pyrenees—to Santiago de Compostela in Galicia, in northwestern Spain. Actually, to be more specific, I walked the Camino Francés, the French Way, because in Spain there are many pilgrimage routes to Santiago: the Camino de Norte, the Camino Mozárabe, the Camino Portugués, the Via de la Plata, the Camino Inglés, the Camino Primitivo. The route I walked, the Camino Francés, has been the main route for people making the pilgrimage to Santiago from France, Belgium, the Netherlands, Germany—pretty well anywhere in continental Europe. In fact, there are three major pilgrimage routes across France that connect with the Camino Francés. If you live in Brussels or Prague or Budapest, it’s possible to walk of out your front door and to keep walking until you reach Santiago de Compostela. Two of the pilgrimage routes across France join together in Saint-Jean-Pied-de-Port, and it’s become one of the “standard” places to begin walking to Santiago. You can start pretty well anywhere you want to, but a lot people start their journey in Saint-Jean-Pied-de-Port. But wait a minute. What’s all this about a “pilgrimage”? And why Santiago de Compostela? Well, this is the story: After Jesus died, one of his disciples, James, went to Iberia, what is now Spain to try to convert the people who lived there. He sailed to the Roman port of Finisterrae—the end of the world, according to the Romans, who believed it was the most western point in Europe—and wandered around Galicia, preaching. He didn’t make many converts, and he returned to Jerusalem, where he was martyred by the Romans. After his death, according to the legend, James’s body was put on a boat and returned to Iberia, where it was buried in the middle of nowhere and forgotten. Then, in the ninth century—so, some eight hundred years later—a hermit saw strange lights shining in a field one night. He told the local bishop, who decided to investigate. According to the story, a star led the bishop to the place where Saint James had been buried centuries before. A chapel was built on the site, and then a basilica, and eventually the current cathedral, which took more than one hundred years to complete, was constructed. The cathedral still contains the bones of Saint James, or whoever’s bones they are, as a holy relic. Now, medieval Christians believed that such relics had real power, and that making the trip to be near them would guarantee their salvation. So almost immediately after the first chapel was finished, people started making the journey there. Most of them walked, because only the richest people could afford horses, and they came from all over Europe. Soon tens of thousands of people were making the journey to Santiago every year, most of them along the Camino Francés. So many people were making the journey that the church started to build places for them to stay—hospices and hospitals—and the Knights Templar started building bridges at river crossings and trying to keep the pilgrims safe from the bandits (and wolves) that made the trip such a dangerous affair. For hundreds of years people kept coming. There are statues of them all over northern Spain: pilgrims—peregrinos—in their rough cloaks and sandals, wearing wide-brimmed floppy hats, carrying the pilgrim’s staff and a gourd full of wine and a scallop—the symbol of Saint James the Pilgrim. There are images of Saint James the Pilgrim, dressed like a peregrino, all along the route. There’s another version of Saint James that was very popular in medieval Spain, though: Saint James Matamoros, the Moor Killer. According to legend, he appeared to a Christian army fighting the Moors—the Arabs who controlled southern Spain for centuries—in the year 844. Sometimes you see his image in churches, waving a sword and riding his horse over the bodies of his enemies. Saint James the Pilgrim comes across as a much nicer fellow. Eventually the pilgrimage to Santiago came to rank with the pilgrimages to Rome and Jerusalem in importance—and since it was a lot easier, safer, and cheaper to get to Santiago, that pilgrimage became more popular. Some say that the pilgrimage to Santiago helped to create the idea of Europe: people from one country met people from other countries along the way and learned that foreigners didn’t have horns and hooves and a pointed tail. In fact, they discovered that they had a lot in common with people from other countries, people who spoke other languages. And others say that the pilgrimage route helped to keep Spain from being completely dominated by the Muslim kings who ruled most of the country throughout the middle ages. And then people stopped coming. The belief in the power of holy relics became less potent. The church started putting the brakes on pilgrimages, which were often an excuse for drunken parties and all kinds of lawlessness and shenanigans. Some of the footpaths the pilgrims walked on grew over and disappeared; others were widened into roads and highways. Cut to the 1980s, when a Spanish priest named Don Elías Valiña Sampedro decided to revive the pilgrimage route. He traveled across northern Spain with brushes and cans of yellow paint, marking the route to Santiago with yellow arrows. People started making the pilgrimage again. Volunteer groups sprang up and started to continue the work Don Elías started. Aware of the possibilities for tourism, cities along the route began to mark the way with bollards and bronze scallop shells. Fuentes—water fountains, where peregrinos can refill their water bottles—were installed in towns and villages. Albergues—hostels—were opened. Books about the pilgrimage were published, and that led to more people walking to Santiago. Today, some two hundred thousand people arrive in Santiago de Compostela every year—most of them on foot, some on bicycles, and a few on horseback, and most of them after walking along the Camino Francés. The entire route is now a UNESCO World Heritage Site. That’s all well and good, but none of it explains why a reasonably rational and sane person would decide to walk twenty or thirty kilometres every day for five weeks to arrive at a cathedral containing the bones of a saint he doesn’t believe in. So why did I do it? Well, I about to turn 50. How did that happen? I could feel time’s wingèd chariot drawing near, as the poet said. And my employer was talking about getting rid of me and everyone else who works on contract. If that happened, I would have to think of something else to do, and I really had no idea what that something might be. I needed time to think about my life, about how I was going to spend the next twenty years. I’d heard of the Camino de Santiago before. I remembered the writer André Alexis talking about it on Radio One twenty or so years ago. The names of the places he spoke of—Saint-Jean-Pied-de-Port, Santiago de Compostela—stuck in my memory, perhaps because of the way his strange whispering voice susurrated over them. And I loved my copy of the late Canadian fiddler Oliver Schroer’s CD Camino, which had been recorded in churches along the route—mostly churches in France, as I learned later, since Schroer walked from Le Puy, in southern France, to Santiago, and the churches in Spain are almost always kept locked. Anyway, I loved that music and I was captivated by the sounds of the Camino—cacaphonous Spanish church bells, footsteps, sheep—that were mixed in with his playing. I felt a strange pull, almost a command, somewhere deep inside myself: I had to walk the Camino. The author Phil Cousineau, who has written a book called The Art of Pilgrimage, describes this feeling as “the call.” That’s not language I’m comfortable with: it’s too spiritual, too churchy. But that’s how I felt. I was called to walk the Camino. The funny thing is, most of the friends I made—and it was only with people I knew fairly well that I would even bring this up—were also walking because they were at some transition point in their lives and needed time to think about what they were going to do next. Some were considering retirement; others were thinking about going back to school. I walked for three weeks with a woman from Denmark who was considering dumping her boyfriend and changing jobs. (He’s gone and she’s about to start her own business.) Other people were obviously at some kind of crossroads: they were finishing school, leaving the army. I wonder if the majority of people walking the Camino are at some transition in their lives—maybe even the Spanish guys who get together to cycle the route, all wearing the same team jerseys; maybe even the German family with four kids under the age of ten who were walking the route with the father pulling a loaded wagon behind him. The office that looks after peregrinos in Santiago—the place where you go to get your diploma, your compostela, that certifies that you completed the pilgrimage—asks whether your motivation was cultural, religious, spiritual, or recreational. Most of us, I’d guess, check the box marked “spiritual,” if only because we walked the Camino because we were at some kind of transition point. I could be wrong about that, but I don’t think I am. What’s it like to actually do the walk? For me, a typical day on the Camino started early. I was always up early, usually before six o’clock—partly because it’s hard to sleep on a bunk bed, partly because there are never enough toilets in the albergues and I never felt like waiting in line. I’d get dressed and pack my gear in the dark, helped by my little LED headlamp. Then I’d eat something—usually bread and cheese and some fruit—and then I’d hit the road. If there was coffee around, even if it came out of a machine, I’d get some; otherwise I’d just start walking. I’d walk for a couple of hours in the chilly autumn air and then stop at a bar for another breakfast, usually a cup of café con leche and a bocadillo de tortilla—an omelette sandwich. Then I’d walk again until lunch time—usually more bread and cheese, maybe bread and chorizo, or dried sausage, eaten while sitting on a bench in a village or a stone wall. Then I’d walk again until I reached the village where I’d decided to stay the night, and I’d find a space in another albergue. Some days I walked alone; some days I met up with friends; some days I talked to people I met along the way; some days I kept more or less to myself. 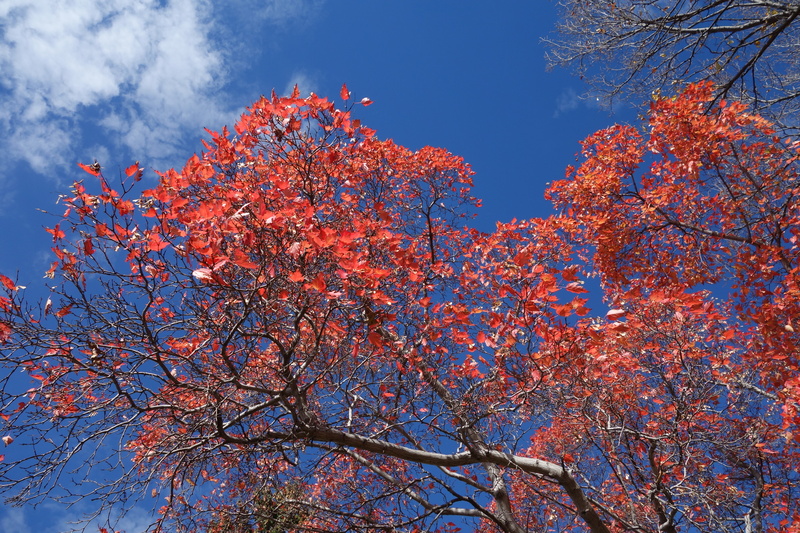 Usually I stopped walking by two o’clock or so—you don’t want to walk too late because you might find the albergues have filled up. “Estamos completo! We’re full!” Athough it never did happen to me, two or three times I got the last bed in the place. Then it was time to shower and change into my after-walking clothes, do some laundry, drink beer and write in my journal, take a nap, wander around the village, buy more bread and cheese and fruit and chocolate for the next day. If I was lucky, I’d find a working computer and check my e-mail—Christine, my partner, sent me a message every day, but now that everyone carries an iPhone and most bars and albergues have WiFi, or WeeFee, as they say in Spain, the public, coin-operated computer is becoming more and more rare. Eventually it was time for supper. Usually I’d eat somewhere with a menu del peregrino—a special menu for pilgrims: two courses, a bottle of wine, and dessert for nine or ten Euros. It’s not a bad deal, unless the food is dreadful, and sometimes it is. The wine is always good, though. The best suppers were the ones I cooked together with friends, but that only happened a handful of times. There’s isn’t always a kitchen, and you don’t always end up staying together in the same place. Anyway, by the time supper was over, it would be getting on for nine o’clock—bedtime for someone who walked thirty kilometres and got up before dawn to do it. And then, the next day, I’d do it all again. But that’s just an average day—it doesn’t give you any sense of what it’s really like to walk the Camino. What it’s like to visit a Romanesque church, like the one at Eunate, or the stunning Iglesia de San Martín de Tours, in the little town of Frómista. Or what it’s like to spend an afternoon in the incredible cathedral in Léon, lit by sunlight streaming in through huge panels of stained glass. Or to stay in the Albergue de San Esteban in Castrojeriz, where the walls are covered in big framed colour photographs of people walking the Camino—it’s like bedding down in an art gallery. And the hospitalero there—Paco del Río, one of the friendliest people I met in Spain. Or what it’s like to see the sun rising every morning over the mountains behind you—because there are always mountains, in every direction, it seems. Or what it’s like to walk through olive groves, or vineyards where the grapes are so close to the path that you can eat your fill if you want to. Or what it’s like to cross the Pyrenees on foot during a September snowstorm, and to realize that they aren’t just hills—they are serious mountains. Or what it’s like to walk on a Roman road—an actual Roman road, on stones laid down by centurions two thousand years ago—or to cross a Roman bridge. Or what it’s like to spend days walking across the meseta, the high plain in central Spain—over rolling hills and through fields of wheat and barley and sunflowers. It’s like walking across southern Alberta, but with decent coffee. Or the strange, powerful waves of emotion that come over you when you least expect them. One of the Spanish expressions for the Camino is la Ruta de las Emociones—the Path of Emotions—and that name absolutely fits. And then, once you’ve crossed the Pyrenees and the wine country of Rioja and you’ve been through the cities of Burgos and Léon and you’ve walked across the meseta, you’re in Galicia, the Celtic part of Spain, which is like walking across Scotland. You know the saying that the rain in Spain falls mainly on the plain? Forget about that—it falls mainly in Galicia. And Galicia is where you start getting a sense that your walk is almost over. You start seeing bollards—stone or concrete pillars marking the route—that tell you how many kilometres are left until you reach Santiago: one hundred, eighty, fifty, forty, thirty-five. A year ago tomorrow, I walked a long, long day—thirty-six or thirty-seven kilometres—to get to a place just outside Santiago called Monte del Gozo, just so I could walk the last five kilometres into Santiago the following morning and get to the cathedral before the daily pilgrim mass in my dirty walking clothes. It’s more meaningful that way, a guy named Bob from Salisbury, England, told me, and I think he was right. Always listen to Bob from Salisbury—he’s walked the Camino three times. I wept like a child when I hugged the big gold statue of Saint James in the cathedral—one of the things pilgrims are supposed to do on their arrival. And then—unless you’re planning to keep walking to Finisterre and Muxía, towns on the Atlantic coast, like I did—that’s the end. You slowly metamorphose into a tourist and then you take a taxi to the airport or the train station for your trip home. But none of that really gives you any sense of why I’d want to go back and walk the Camino again—or, more likely, one of the less-travelled routes, the Via de la Plata from Seville or the Camino Portugués from Lisbon, or the Camino del Norte along the northern Spanish coast through Irun and Bilbao. And I’m not sure I have the words that would explain it. Because walking the Camino is an incredible experience. Everything in your normal life—all of the daily cares and worries and preoccupations—all of that falls away. You have almost nothing to worry about—just whether you’ll have a bed that night, and unless you’re walking in the summer, the busiest period, you really don’t have to worry about that, either. You have almost no possessions—just what you’re carrying on your back—and somehow that frees you from the tyranny of things. Every day is the same, yet at the same time every day is different: you pass through different landscapes, through different towns, past different mountains. You have a goal—to reach the cathedral in Santiago de Compostella—but until you get to Galicia it seems so far away that you don’t have to worry about getting there. There is almost nothing to worry about. Or maybe it’s the endorphins coursing through your body—walking with a pack isn’t as strenuous as, say, running a marathon, but it’s not easy, either. Maybe it’s just the act of walking that far every day—it’s becomes both exercise and meditation, the steady pace of your footsteps and your breathing working together like a nonverbal mantra. Maybe it’s the way that travelling at four kilometres per hour gives you a tremendous intimacy with the terrain through which you’re passing. Maybe it’s the way that this kind of travel blends novelty—since you’re walking through new places every day—with routine, the daily routine of putting one foot in front of the other. A year later, I’m not sure why it’s such a powerful experience. I just know that it was one of the best experiences of my life. Everything seems more vivid, more alive, on the Camino: the food, the places you pass through, the friends you make. When I finally did get to Santiago, I was fitter and thinner and happier than I’d been in years. So, I did walk five hundred miles, and I would walk five hundred more. I hope I get the chance, and I hope it comes soon. And if you’re at some transition point—if you’re about to retire, if you’re about to graduate, if you’re thinking about making a change in your life but you’re not sure you’re ready—and you have a few weeks, you could do a lot worse than walking the Camino. Even if you’re not at some transition point and just want to get away for a while. Even if you just want to lose a few pounds while eating everything you see. The point is, whatever your motivations, wherever you start, it will be an amazing journey. Two hundred thousand pilgrims a year can’t be wrong. A while back, Christine asked me if I’d give a talk on walking to the students in her creative technologies course. They’re working on something called #3citylink–you can check it out on Facebook–that will link them with art schools in Coventry, U.K., and Gyumri, Armenia. They’re in groups and they’re supposed to make something–from the number of film students in the class, I’m assuming (perhaps wrongly) that most of them will make videos–about this city. So, this morning I gave the class a short talk about three ways that walking might intersect with their projects. It might help dissolve any creative blocks they might experience–studies have shown that walking is good for creativity. It could be used as a form of research–a way of getting to know the city where they live. And, like the work of Richard Long or Janet Cardiff, it could become the basis of an art project in its own right. Then we went for a six-kilometre walk. What a great way to spend a beautiful Indian summer morning! I wonder what kind of work they’re going to end up making, and if walking will play any part of it. There’s a big park on the south side of this city, built around an artificial lake. Or maybe two lakes, depending on how you look at it, since the lake is divided in two halves by a bridge, and the two halves are quite distinct. The smaller side is used for boat races, and on a sunny day October day like this, it has many people walking around it. The larger side is a bird sanctuary and fewer people take the time to walk around it. I don’t know why–maybe because it’s a longer walk. 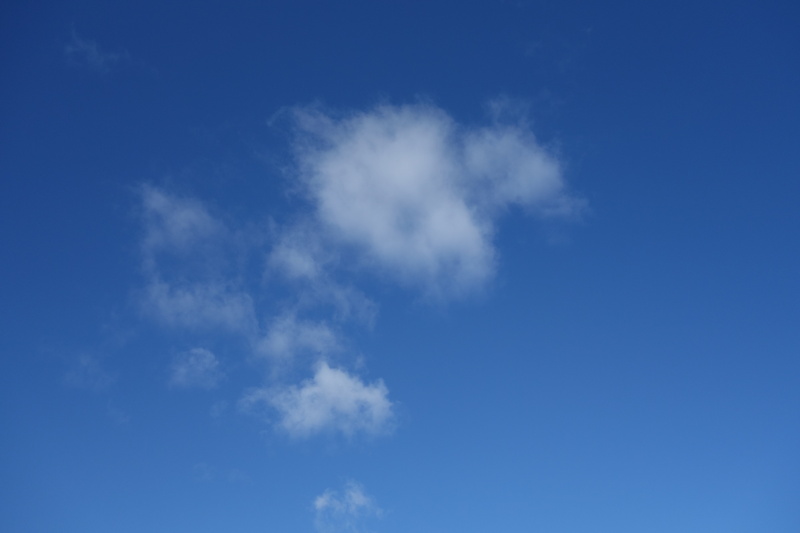 In any case, today we walked around both sides–a 12 kilometre loop from home and back. I’ve walked this path many times. When I first started thinking about walking the Camino, I had a hard time getting around both sides of the lake. Later, when I was more fit, I would walk the big loop twice. Since I’ve walked this path so many times, I didn’t think I’d see anything new today, but I did. Several things, actually. 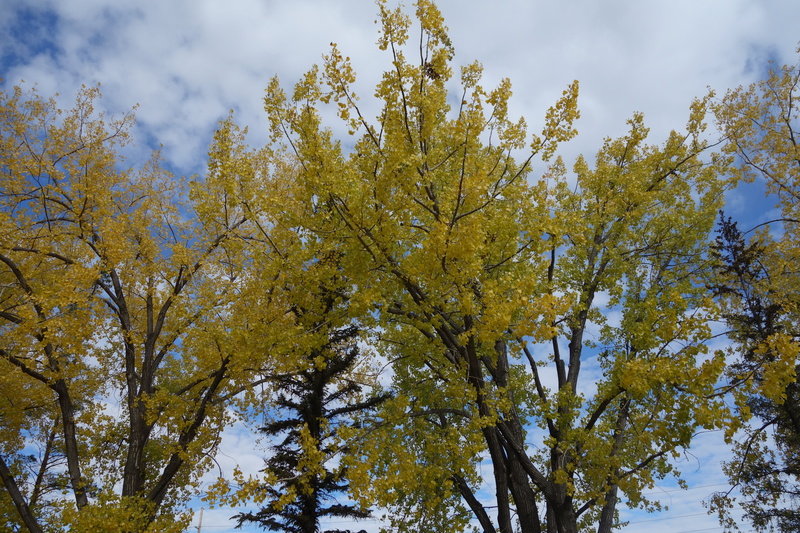 The fall colours surprised me–I hadn’t thought about how much the park changes in autumn. 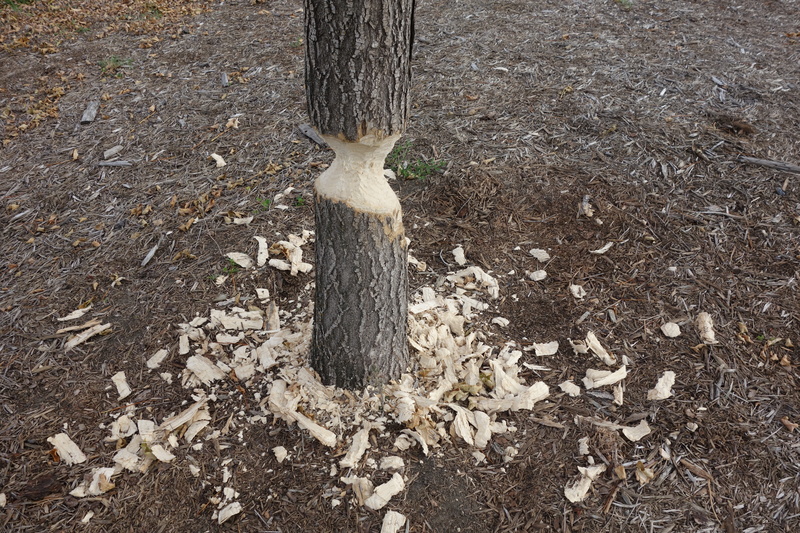 Also, beavers have been active, cutting down a tree near the university and damaging another so badly that it won’t survive. 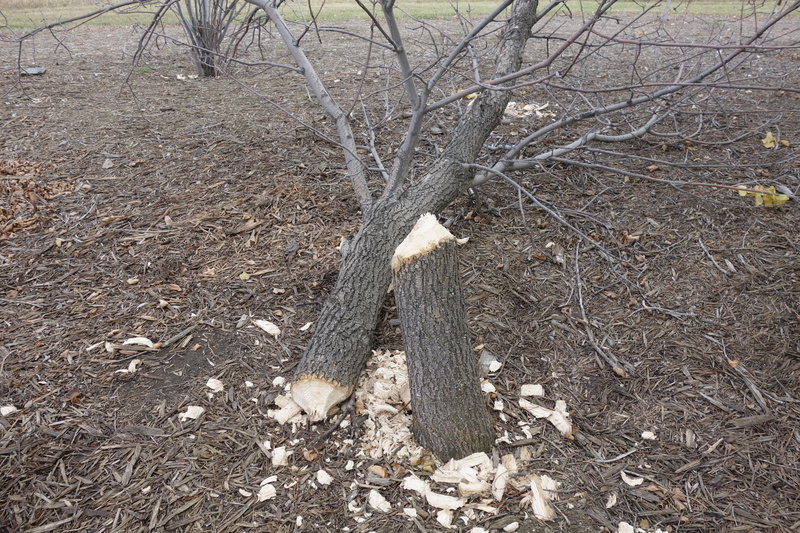 I know there are beavers living in the creek but it’s been a while since I’ve seen their handiwork up close. 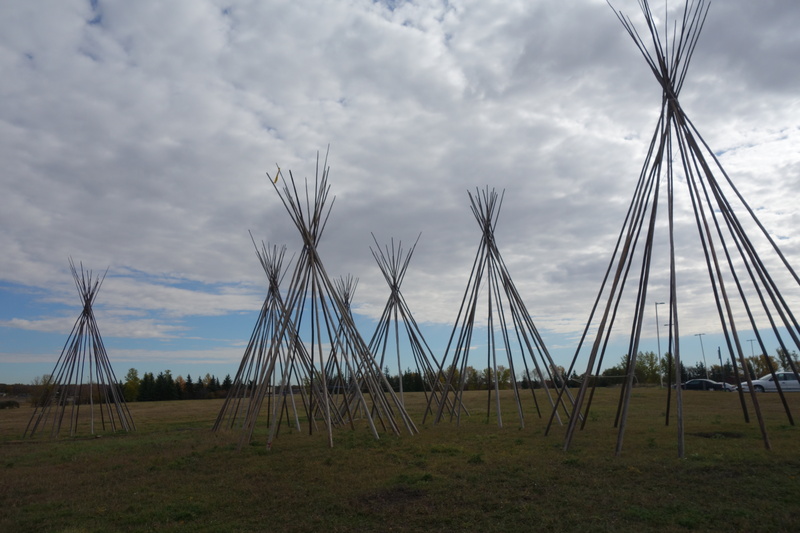 A few weeks ago, First Nations University sponsored an event where teams raced each other to put up teepees. The poles have been left standing near their building. Yes, I should have taken this picture with the sun behind me. I don’t know what I was thinking. 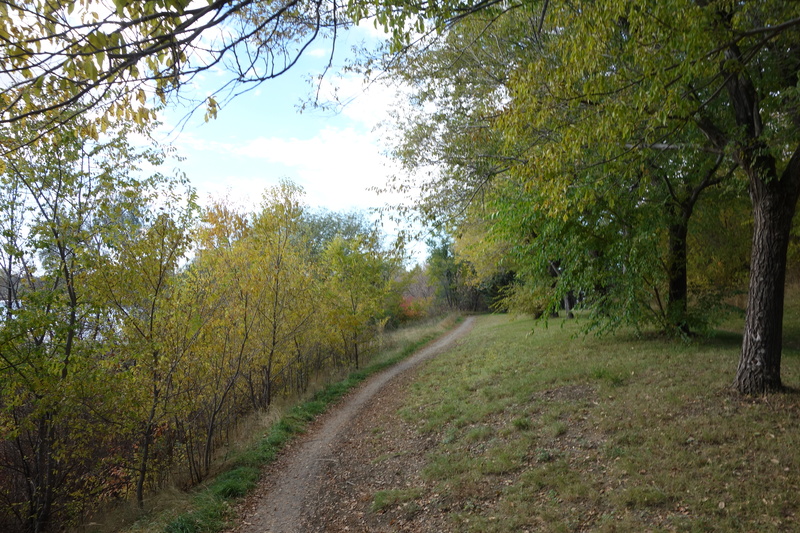 Most surprising of all was the discovery of a footpath that runs along the north side of the bird sanctuary. I had no idea it was there. It runs behind the Science Centre, through a forested picnic area. 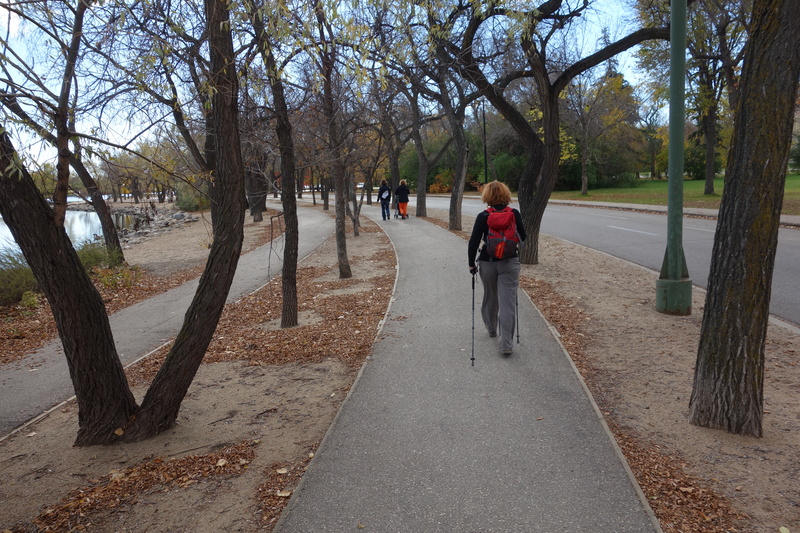 There’s a sign that describes it as a winter footpath, but people are using it in other seasons, too. Who knew that a route I’ve taken so many times before would still have new things to show me? I guess that you never know what you’re going to see if you just keep your eyes open. 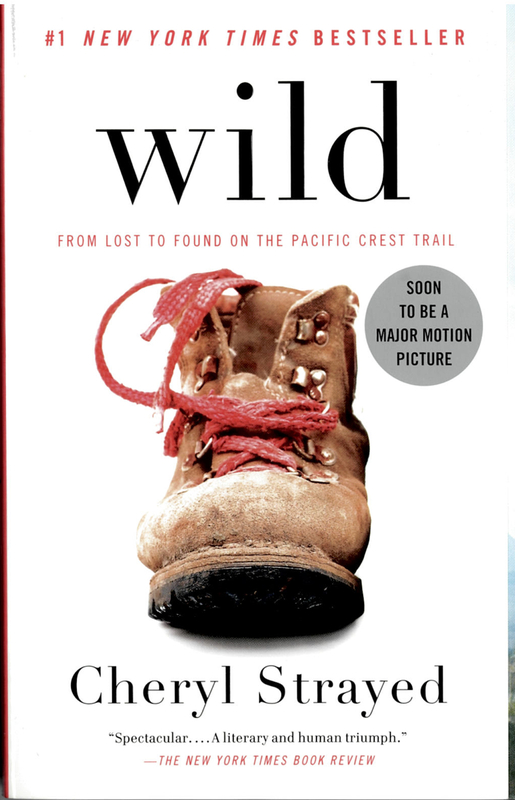 I finished reading Cheryl Strayed’s book Wild: From Lost to Found on the Pacific Crest Trail on the weekend. It’s been on my list of books to read about walking for a while now, but about a month ago I saw a trailer for the forthcoming film adaptation, starring Reese Witherspoon, and decided to get to it before the movie came out. I’ve noticed a couple of things about memoirs of hiking or walking trips. The narrative interest is directly related to the incompetence, at the beginning of the trip, of the walker. That gives him or her something to overcome and it makes it easier for a sedentary reader to relate to the story. After all, most people who read these things will never attempt anything similar themselves. It’s certainly true that the most interesting books about the Camino, and the funniest, are the ones like Hape Kerkeling’s I’m Off, Then! or Jack Hitt’s Off the Road, where the protagonist is completely unprepared for the journey and makes all kinds of mistakes–at least at the start. Part of what the narrative chronicles is how the protagonist learns, his or her journey from innocence to experience. And the protagonist’s account of his or her incompetence creates comedy. Wild is like that. I’m not an expert backpacker by any means, but I laughed at Strayed’s account of the heaviness of her backpack when she set out to walk the PCT. True, she’s hiking solo, which means she has to carry everything herself; if you’re hiking with someone else, you can share some of the burden (you’ll only need one tent, for instance, or one water purifier). But Strayed is completely out of her depth at the start. She’s done no training. She hasn’t read the manual that came with her compass. She hasn’t figured out what’s essential to carry and what can be left behind. She hasn’t even tried to get all of her gear into her backpack. You have to admire her determination as she overcomes the obstacle of her own inexperience as well as the obstacles the trail throws at her. The other thing I’ve realized about these memoirs is that the greater the emotional burden of the protagonist is–the more broken he or she is at the beginning of the journey–the more powerful the narrative becomes, because the protagonist has more healing to do. Wild is like that, too. At the beginning of her journey, Strayed is lost. Her mother has died, she’s divorced her husband, and she’s been having affairs with random strangers–and with heroin–in misguided attempts to come to terms with these losses. She’s also carrying a deeper pain with her–the pain of her father’s abuse of her mother and his abandonment of the family. 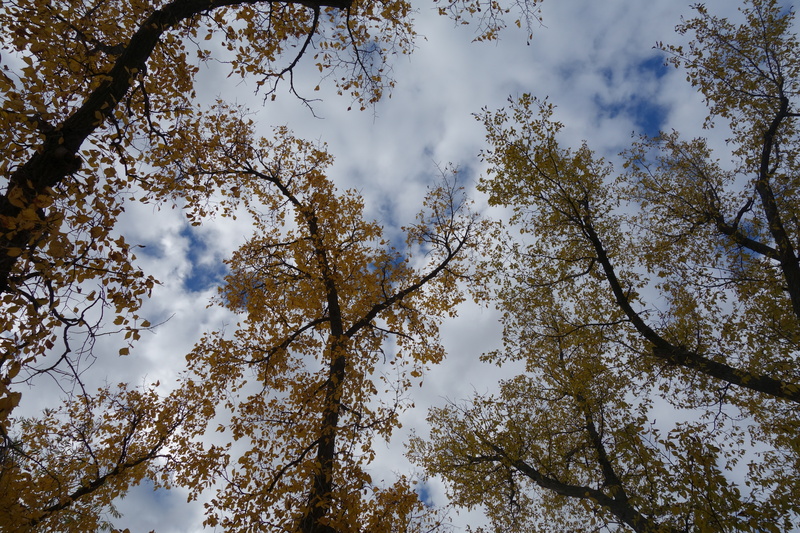 As she walks the PCT–and this isn’t a spoiler, because it’s an obvious feature of the subgenre–she comes to terms with these losses and overcomes, to some extent, her pain. She doesn’t quit her hike, even when everything goes completely wrong, and perhaps its that dogged determination to carry on that helps her to heal emotionally. Maybe it’s just the act of walking that heals her–walking despite the way her feet constantly hurt. (She’s one of those unlucky people whose feet never get used to walking.) I don’t know–it’s probably both her courage and determination and something about the act of walking itself that matter. So this is a very gripping story of a long, long walk (some 1,100 miles) and I’m glad I read it. It’s made me start to think about what it might be like to hike the PCT myself. Not right away, of course, and not without a lot of preparation–it’s one thing to read about the comedy of inexperience, but it would be something else to live through it. John Allemang walked to the airport in Charlottetown and wrote about his experience here. Well, you could walk to the airport in this city, too. Someday I’m going to do it–shoulder my backpack and walk to the terminal and board my flight. Why not? My friend Brian posts photographs of his walk to work on Facebook. He always manages to find something compelling to look at. Maybe that’s because his walk takes him through a neighbourhood where people are always doing something strange or interesting; maybe it’s because he’s a filmmaker and has a keen visual sense. Both are probably true. I’ve been meaning to walk to work with a camera this week and see what images I could capture. Early this week it was overcast and raining–not great weather for photography–but today was bright and sunny and cold. Really cold, although it’s going to get a lot colder very quickly. Last week it was 30 degrees here; this morning it was minus 1 with a fierce northwest wind that makes it feel even more frigid. It’s the kind of weather that demands wool hats and gloves, and I didn’t think to bring along either. 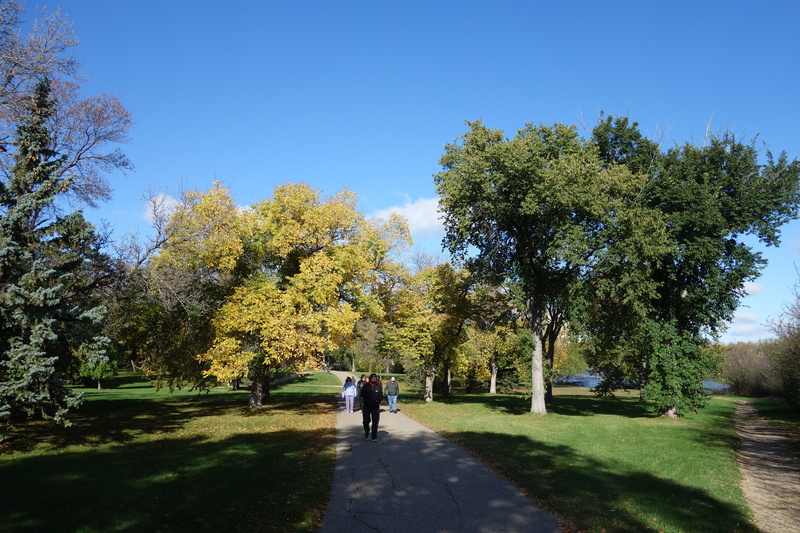 My walk takes me through Wascana Park, and despite the weather–or maybe because of it–there were quite a few people out walking, too. 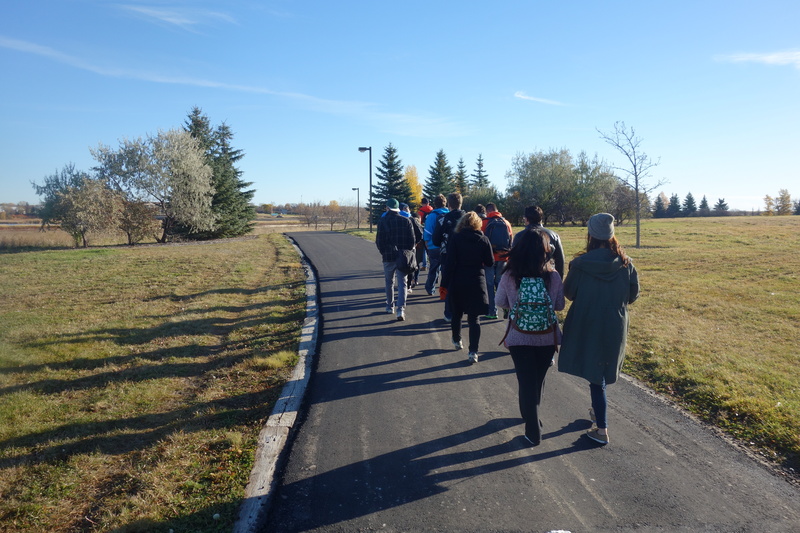 It was strange to see so many people out for a walk on a Friday morning, but maybe they’re government employees who work flex time and get Fridays off. I don’t know. My camera battery was dying so I wasn’t able to get many pictures, and the ones I did take aren’t like Brian’s. 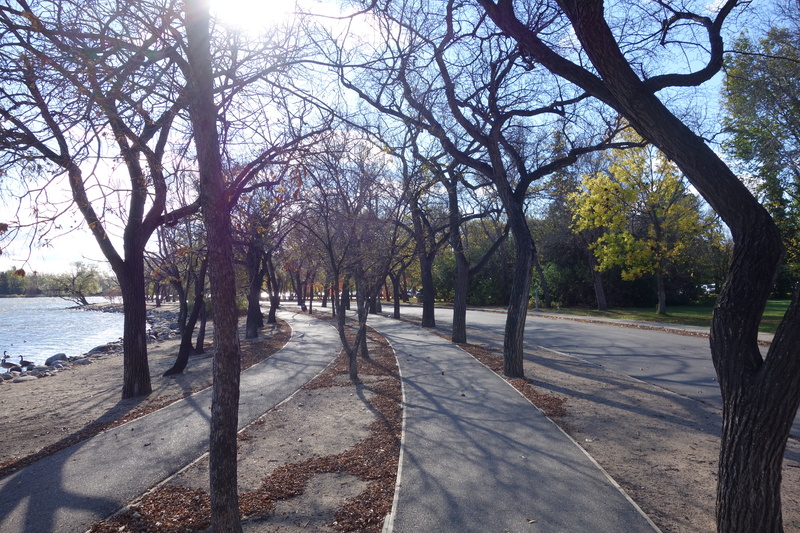 But I’m not a filmmaker the way Brian is, and Wascana Park is perhaps not as inspiring as a neighbourhood because it’s so empty. Usually when I walk through the park I spend my time thinking instead of taking in the scenery. It’s an interior journey, not an exterior one. And that’s okay. I’ve been walking this route for years, and on the rare occasions that there’s something surprising and new to see, I’d like to think that I manage to apprehend it, like the injured snow goose I saw last September, or the Baltimore oriole I saw this past summer. I could be wrong, of course. Maybe I should keep paying attention even on a routine walk I’ve made hundreds of times before. That’s something to think about on my walk home.